The Holly Springs 6 is a spacious, easy to pitch, family tunnel tent, packed full of features to ensure comfortable outdoor living for families. Featuring a bright and airy central living area with large windows with covers, the Holly Springs offers plenty of room to shelter on the campsite should the weather take a turn for the worse. The vis à vis BlackOut Bedroom configuration provides extra privacy, perfect for families with older children or couples. The revolutionary extra-large, BlackOut Bedrooms block out up to 99% of light for a longer sleep and prevents you waking with first light. Heavy rain is no match for the polyester flysheet which has a hydrostatic head of 4,000mm as well as fully taped seams, combined with the tough and integrated polyethylene groundsheet, you’re assured a dry and bug-free interior while the peak over the door provides shelter on entry and exit. For peace of mind, all tent fabrics are fire retardant for greater peace of mind. Extra security is provided thanks to the zipper stoppers on the tent doors, this ensures that zips are always within easy reach in the event of an emergency, even for children. A fabric's waterproof properties are measured using a rating called its hydrostatic head. If a tent has a hydrostatic head of 3000mm it means that a 3 metre column of water can be placed on its surface before any drops will show through the underside of the fabric. (The Ministry of Defence in the UK classifies fabric with a hydrostatic head of 800mm+ as waterproof). There are many other factors which influence the performance of tent in tough weather conditions. Coleman use the latest technology and a rigorous testing regime to ensure that we keep you protected at all times - whatever the weather. The revolutionary sleep system from Coleman® is ideal for parents or anyone who is sensitive to daylight. BlackOut Bedroom® blocks up to 99% of daylight from entering the sleeping area, helping you get a longer and more restful sleep - whatever time of day. WINNER of the Camping Magazine's 2016 Editor's choice Awards in the Best Camping Innovation category. 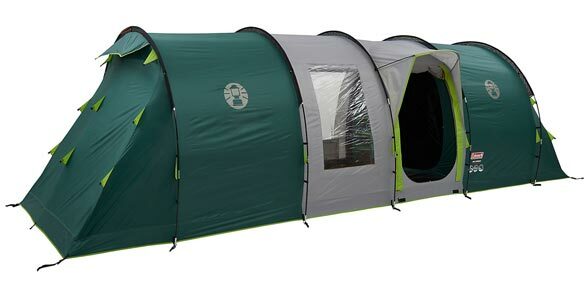 Coleman XXL Bedrooms are designed to be mores spacious than the average tent bedroom. Comfortably accommodating our larger double air beds, they offer plenty of space to make your camping trip more enjoyable and helping you get a better night sleep, in the great outdoors! Fire Retardant - safety first! The fire retardant characteristic of our material ensures that the fabric will not flare dangerously out of control and will self extinguish, giving time to escape in the event of an emergency.